A software program that covers every aspect of essay writing – from note-taking and making essay plans to referencing and avoiding plagiarism. 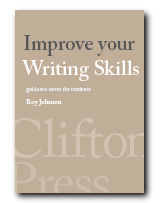 Learn how to write good introductions, use quotations effectively, and construct persuasive arguments. 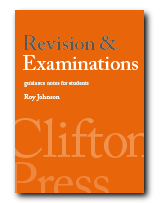 Plus huge range of sample essays and tutor-marked assignments. Writing Essays 3.0 covers every aspect of essay writing – from note-taking and making essay plans to referencing and avoiding plagiarism. Learn how to write good introductions, use quotations effectively, and construct persuasive arguments. 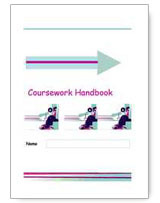 Suitable for all students in further and higher education. 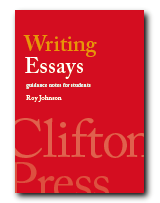 Includes a wide range of sample essays in humanities and social sciences. Runs in any Web browser. Latest version lets you customise your choice of screen fonts and background colours. 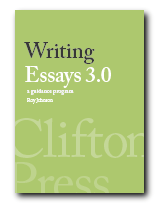 This program will help you to write better essays. Your grades will improve. You will learn the techniques and develop the skills required for producing successful essays and term papers. The guidance is arranged in A to Z format. How to maintain correct agreement between subjects and their verbs. How to recognise key terms and instruction terms in the question(s) you have been asked. How to present your observations in the form of arguments supported by evidence. The correct way to use round and square brackets in academic writing. Where to use capitals in the names of people, titles, places, events, and institutions. A checklist of what to look for after you have completed the first draft of your essay. It’s easy to forget details: a checklist helps. The colon is used to introduce a list, or to separate two clauses. How to do it. When and how to use commas in your writing. A conclusion should draw together and summarise all the arguments in your essay. A checklist to help you eliminate small blemishes and mistakes in your writing. How to cite correctly and give references from electronic sources in your work. How to deal with the information you need to support your arguments. How to use full stops correctly – and where they are not needed. How to recognise and avoid the common mistake of making general rather than specific claims. How to understand the traditional systems of awarding grades to academic essays. How to use them to improve the quality of your writing. Some basic guidelines for improving your grammar without learning complex rules. How to use the popular Harvard system of bibliographic referencing. How and when to use hyphens – and when they are not used. An explanation of the terms commonly used in essay questions and instructions – and what they require in your answer(s). How to arrange and print your text on the page to make it as attractive and readable as possible. How to recognise and avoid the common mistake of unwanted moral judgements. A checklist for re-writing your work to improve its quality. How to decide on the amount of research your assignment requires – at various levels. How to show bibliographic references in your work, using traditional systems. How to avoid repeating the same names (people and places) and key words. How to use Internet search engines to locate materials and information. The strengths and weaknesses of spell checkers, and how to use them. The importance of good organisation – and how to create it in your work. 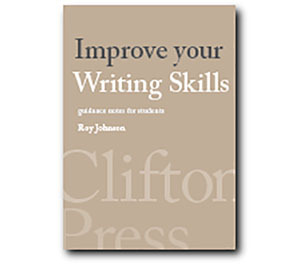 A simple prose style will help you to avoid the problems of over-complicated writing. How to show the titles of articles, journals, newspapers, magazines, films, and books. The relationship between your chosen topics and the structure of your essay. Six different approaches to composition – from improvisation to cut and paste.